A collectible calendar. 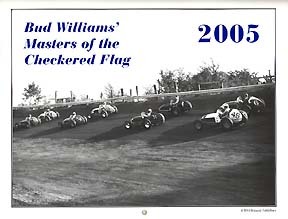 This makes the sixth year for this Bud Williams calendar series! Photos include Larry Crockett, Jerry Hoyt & Bob Sweikert for January; Hal Robson, Orville Epperly, Johnny Shackleford, Carl Ott for February; Pat O'Connor, Mike Nazareth, Red Renner for March; Joe James & Jimmy Bryan for April; "Pappy" Booker & Bus Wilbert for May; Johnny Rutherford & Bob Pratt in June; Bill Schindler for July; Jack McGrath, Troy Ruttman, Mel Hansen, Jackie Holmes & Tommy Mattson for August; Tommy Hinnershitz & Speed McFee for September; Parnelli Jones, Jim Hemmings, & Bud Tingelstad for October; Ted Horn for November; "Wild Bill" Cummings & Ernie Triplett for December; Walt Imlay's honors page photos include Jud Larson, Chuck Arnold, "Jiggs" Peters, Johnny Thomson, Charlie Musselman, Elmer George, Len Duncan, Van Johnson, Bill Randall; back cover page include Joie Ray, Deb Snyder, Hector Honore, Bobby Grim, Marvin Pifer, & Jim McWithey; front cover shows the front four rows for 1954 Dayton 100. (Nazaruk, Freeman, Sweikert, Hoyt, Crockett, O'Connor, George, & Daywalt). Only the best photos were used for this historic calendar. A special tribute to the late photographer Walt Imlay.